Fenugreek (Trigonella foenum-graecum) is a plant from Fabeaceae family which is used for many medical plans. Fenugreek is used in may cuisines either as a herb, as a spice, or as a vegetable. Fenugreek also has many pharmacological effects and is lately very popular in the bodybuilding world. Bushey, Brandon, et al. conducted a study, supported by Indus Biotech, on forty-five resistance-trained males, who were given either 500 mg of fenugreek extract or placebo. There were no changes in the metabolic hormones insulin, cortisol or leptin. No significant effects for groups were observed for the anabolic hormones free testosterone and estrogen (p<0.05). However, supplementation of fenugreek extract resulted in a decrease in serum dihydrotestosterone (DHT) levels (-9.42%) in comparison to placebo. Other anabolic and metabolic hormone analyses were not affected by supplementation. Another study  evaluating fenugreek as 5α-reductase inhibitor failed to affect dihydrotestosterone (non-significant increase) levels. However, the group receiving 500 mg of fenugreek daily significantly increased total testosterone (6.57%) and bioavailable testosterone (12.26%). Because of this significant increase in total and free testosterone without a corresponding increase in DHT and estradiol, fenugreek appears to inhibit (but incompletely) aromatase and 5α-reductase activity. One very recent study  carried out in the Centre for Integrative Clinical and Molecular Medicine has found that 60 men aged between 25 and 52 who took a fenugreek extract twice daily for six weeks showed an overall positive effect on physiological aspects of libido (sexual drive or desire for sexual activity). Serum prolactin and testosterone levels remained within the reference range. Though fenugreek is, by some companies, marketed and sold as »testosterone booster«, most studies do not support this claim. It does seem to be a weak 5α-reductase inhibitor. 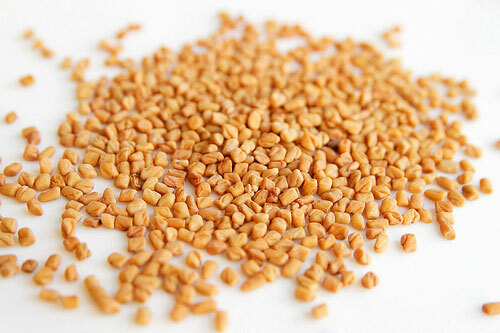 Researchers have shown that diabetic mice which were cured by seed extract of fenugreek seeds, had an increase in weight . The effect of fenugreek on a fat index of diabetic patients with high cholesterol showed that this plant reduced fats significantly . Fenugreek does seem to have positive effects on body composition in combination with resistance training by decreasing body fat percentage [8,12] but its consumption can actually increase estrogen levels [2,9] and can potentially cause gynecomastia (male breast growth). Wilborn et al. reported no significant changes in body mass or lean mass but fat mass decreased significantly in fenugreek supplemented group. Fenugreek also serves as prolactin stimulator  because it contains galactagogue that increases lactation, and has been successfully used for nursing mothers (it may increase mothers milk supply) . Furthermore, fenugreek is a good source of amino acid 4-Hydroxyisoleucine which is known for its anti-diabetic properties [5-6]. Studies evaluating fenugreek for its purported anabolic effects typically use doses ranging between 500-600 mg. 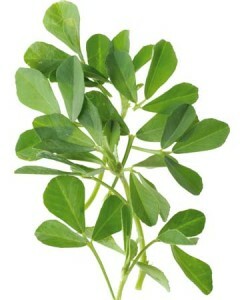 According to WebMD.com : “Fenugreek is likely safe for people when taken by mouth in amounts normally found in foods. It is possibly safe when taken in amounts used for medicinal purposes.” Some of the fenugreek side effects include diarrhea, stomach upset, bloating and gas. Fenugreek might lower blood sugar . Fenugreek can also potentially cause gynecomastia. No side effects were reported by any of the participants in Wilborn et al. study. One study using 3g/kg bodyweight of fenugreek also reported no adverse effects . Xue, Wan-Li, et al. “Effect of Trigonella foenum-graecum extract on blood glucose, blood lipid and hemorheological properties in streptozotocin-induced diabetic rats.” Asia Pac J Clin Nutr 16.1 (2007): 422-426. Hannan, J. M., et al. “Effect of soluble dietary fibre fraction of Trigonella foenum graecum on glycemic, insulinemic, lipidemic and platelet aggregation status of Type 2 diabetic model rats.” Journal of ethnopharmacology 88.1 (2003): 73. Awal, M. A., et al. “Effect of karela and fenugreek on lipid profile in hypocholesterolemic diabetic patients.” Bangladesh J Physiol Pharmacol 15 (1999): 6-8. Turkyılmaz, Canan, et al. “The effect of galactagogue herbal tea on breast milk production and short-term catch-up of birth weight in the first week of life.” The Journal of Alternative and Complementary Medicine 17.2 (2011): 139-142. Sauvaire, Yves, et al. “4-Hydroxyisoleucine: a novel amino acid potentiator of insulin secretion.” Diabetes 47.2 (1998): 206-210. Al‐Habori, Molham, and Amala Raman. “Antidiabetic and hypocholesterolaemic effects of Trigonella foenum‐graecum.” Phytotherapy research 12.4 (1998): 233-242. Bushey, Brandon, et al. “Trigonella foenum‐graecum Extract Supplementation Has No effect on the Hormonal Profile of Resistance-Trained Males.” International Journal of Exercise Science: Conference Abstract Submissions. Vol. 2. No. 1. 2009. Constancio, Eric J., et al. “The Effects of a Proprietary Fenugreek Extract on Strength & Body Composition.” International Journal of Exercise Science: Conference Abstract Submissions. Vol. 2. No. 1. 2009. Sreeja, S., and V. S. Anju. “In vitro estrogenic activities of fenugreek Trigonella foenum graecum seeds.” (2010). Steels, Elizabeth, Amanda Rao, and Luis Vitetta. “Physiological Aspects of Male Libido Enhanced by Standardized Trigonella foenum‐graecum Extract and Mineral Formulation.” Phytotherapy Research 25.9 (2011): 1294-1300. Wilborn, Colin, et al. “Effects of a Purported Aromatase and 5 α-Reductase Inhibitor on Hormone Profiles in College-Age Men.” International journal of sport nutrition 20.6 (2010): 457. Mowl, A., et al. “Antihyperglycemic effect of Trigonella foenum-graecum seed extract in alloxan-induced diabetic rats and its use in diabetes mellitus: a brief qualitative phytochemical and acute toxicity test on the extract.” African Journal of Traditional, Complementary and Alternative Medicines 6.3 (2009). Today is the first time I have investigated the use of Fenugreek for use in testosterone enhancing, as I need this improvement, however, as a sufferer of various medical maladies such as chronic bronchitis, I have found fenugreek seed powder to be the most affective at arresting the cough and repairing the condition. A friend of mine referred me to this as a remedy for my bronchitis after coughing endlessly for 6 months after taking a teas spoon of fresh whole from the health food store in a short glass of juice 20 minutes later my cough stopped. I had my first nights sleep uninterrupted in 6 months…as doctors had no remedy then not even did they apply any antibiotics that now to some success they use. Also, within a week of taking it I stopped, and my bronchitis never returned for about a year then again I applied the same treatment for about a week. Just to let you know of this medicinal use of Fenugreek should not be over looked.